I'm sure most of you would agree that our families are really important to us! I grew up with 4 brothers and sisters and keep regular contact although we are spread out. Getting all together on special occasions is really precious especially as the years go by. Having had what might be called a tumultuous start to life has created a strong bond between us. Dad had been our rock and will get some extra plugs in this and future posts! 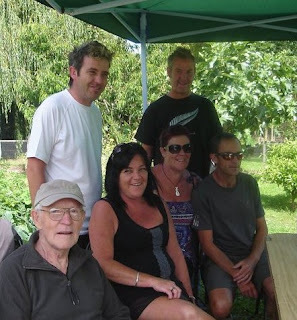 Here is a picture taken on one of those rare occasions when we all managed to assemble at the one place, including my sister, Margaret in Australia. It was taken New Year's Eve at my brother, Vincent's place in Nelson which I posted on recently. In April twelve years ago our family were preparing to congregate from around New Zealand and Australia and descend upon Dunedin! We were coming together to celebrate dad's 70th! The night before I left Wellington to fly down my next door neighbour asked if I had written a song for my dad for the occasion. I replied that I hadn't but since time was of the essence, promptly sat down and worked on it. After about 30 minutes of reflecting and writing my poetic thoughts about what dad meant to me and the family, I excitedly approached the piano. After about another 30 minutes I had a tune and played it through a number of times. Feeling rather pleased with myself I rested easy in preparation for the trip hoping I had something special to present to dad! On arriving in Dunedin and meeting up with my brothers and sisters I was delighted with their enthusiasm for my song. We practised it for several days and on the Saturday night at the conclusion of the celebrations, we all sang it for him as a special birthday surprise. It was quite an emotional performance that we proudly honoured him with. Click below to listen to my song dedicated to my dad called Loving Heart! Some of you have heard it before. When was the last time all of your family were together? Was it a special time? What did you do? Where did you meet up? DO NOT FEEL OBLIGED TO ANSWER ALL THE POSED QUESTIONS!! You can tell me to mind my own business. I can't help if I'm a curious type! 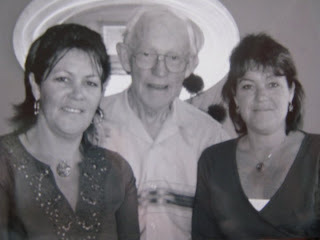 Oct/Nov 2011, we met in the UK under the guise of our parent's 60th wedding anniversary , and to say goodbye to Dad as he was very ill. Dad is still here,but we know that we will not be seeing him again. Since I have the biggest house, the Thanksgiving and Christmas parties are held here. I invite my sisters and their families, my 97 year old mother, and of course, my own daughters and grandkids. It's always nice to spend precious time together. Hello, Paul! I stopped by from Mrs. Micawber's blog. I hope you are doing better now, and recovering soon. Blessings to your nice family! Have a wonderful day! Since there is only the four of us - Mum, Dad, my sister and I - and we all live in the same town, it is not so difficult to get us together. In fact, we were all having lunch at my parents' place on Tuesday, when I was working from home and my sister had time off. Our parents are now 71 and (almost) 69 years old; they are doing well but we are aware of them getting older (such as my sister and I are getting older, too!) and we appreciate the time we still have together. Across the channel in England is my other family who I am still very close with but can only visit once a year. I am very much looking forward to seeing them all again in July: my mother-in-law, my sisters-in-law with their lovely families, cousins, uncles and aunts. I like reading about your Dad, Paul. Due to vast differences in age and location, the cousins only meet up for family weddings and funerals. Sadly, all the older members have left us now.